quarters in Nothing But a Man. Nothing But a Man is an impressive study of black masculinity and the oppressive racial climate of 1960s America. However, this film is complicated by several factors. The first of which is that the director, Michael Roemer, is not black but white. The film is also not part of the black independent film movement but rather what Donald Bogle calls "Black Art Films." Bogle says, "[Appearing] during the first half of the 1960s, a quartet of inexpensively but sensitively made motion pictures offered grimly realistic and cynical looks at black America" (200). Other films of this sub-genre included John Cassavetes' Shadows (1961), Shirley Clarke's The Cool World (1963) and Sam Weston and Larry Peerce's One Potato, Two Potato (1964). Nothing But a Man, positioned before the effects of the Black Power rebellion, coupled with Killer of Sheep coming after the height of the rebellion, demonstrate how little life in the Black community had changed despite the legitimization of the civil rights movement and the fury wrought by the black power rebellion of the late 1960s. 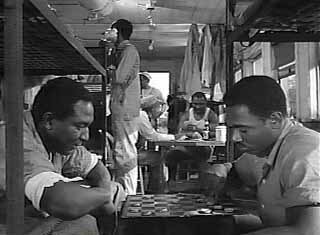 The film may appear to visually resemble many black independent films but in fact the visual similarities end with the use of black and white film stocks. The later films are both filmed on grainy black and white film which speaks to the lack of money and access to better equipment that marked those productions. Nothing But a Man's film stock is not grainy and even though filmed over ten years before Killer of Sheep, its visual quality rivals that of any mainstream black and white production of the period. Its images are crisp and the sound is first rate. Benefiting from a great Motown score, every word and sigh is legible unlike Burnett's and Woodberry's pieces. The cramped quarters of Luchino Visconti's La Terra Trema. However, while Nothing But a Man may differ in its aesthetics, its thematics place it firmly in the company of neo-realist film and the later black independent films. While Killer of Sheep chooses its sphere of interrogation in the inner-city, Nothing But a Man mainly chooses the rural south to lay bare the reality of life for blacks. Its images of the rural ghettos where Duff and his wife live is directly reminiscent of the cramped and simple dwellings of the fishing family in La Terra Trema. The scene of the railroad section gang hunting for rabbits and fishing for their dinner also brings to mind La Terra Trema's family living off their catches, unable to afford "civilized" or store bought food. In Nothing But a Man we even see children playing near a ruined house in a field of weeds which directly calls to mind the children playing in ruins in both Killer of Sheep and Paisan. As with all neo-realist texts, futility plays a large part in the structure of the narrative. Duff equates his masculinity with being able to work and support his family. Without work, he feels he is nothing, not even a man. His frustration arises out of his inability to hold a job in a white controlled environment and still assert his right as an equal human being. Duff's unwillingness to defer to his white "superiors" at the mill and at the gas station causes him to lose both jobs and keeps him from finding another. Duff is not a lazy man who doesn't want to work like other characters in the film. His quest for employment is an exercise in futility as long as he will not defer to the white powers that maintain control over all avenues he explores. This leads Duff to leave his wife and move to the north. However, like Killer of Sheep, Nothing But a Man does not end in futility. As Stan refuses to give into the despair he feels, so too does Duff. In the end, he returns to his wife and picks up his illegitimate son, whom he has never cared for, and is determined to succeed in the very town that doesn't want him. final scene from Nothing But a Man. This distinction between Paisan and these two films is very interesting. Why do these films point to hope in the end while Paisan, and to a lesser extent La Terra Trema, point to futility? In an historical context, the Italians had hope in their future. Their country had been freed of a fascist government and the Germans. African Americans are still faced with the seemingly unassailable wall of racism in America but these two films still demonstrate hope. An explanation of this difference is found in the distinction that neo-realist film was primarily concerned with portraying reality as it was at that time and in the moment. In effect, neo-realism was a statement of current affairs and their effect on the Italian people. Nothing But a Man and Killer of Sheep are also concerned with portraying reality. However, these films are also engaged in a mission that was on-going. The "struggle" for a rightful place in society is a defining element of black identity in this country. Toni Cade Bambara has said that the L.A. School filmmakers "recognized cinema as a site of struggle" (119). This "struggle" is seen most clearly in L.A. School films such as Killer of Sheep and Bless Their Little Hearts but Nothing But a Man also displays this "struggle." Despite the films’ obvious aesthetic differences, as well as Nothing But a Man's white director, they both occupy a common political ground. To include this realization of a "struggle" demands an element of hope. To not include hope would mean the "struggle" would be over. 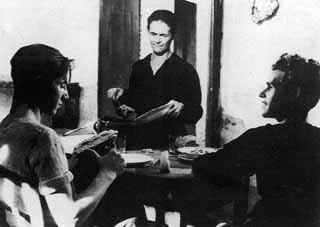 The neo-realist films were mainly concerned with the present in an attempt to narrativize the present state of affairs and document them. That is not to say that neo-realist authors had no expectations, or hope, that things would get better, but the texts themselves are preoccupied with a state of affairs, a moment in history and a state of mind. 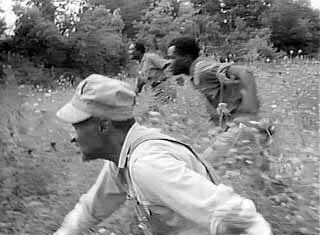 The railroad workers hunting a rabbit in Nothing But a Man.